Title: Planisphaerium Caeleste, published: Nuernberg, Homann, J. B. 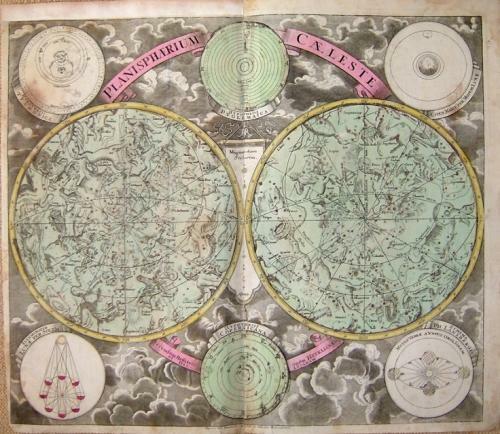 A fine detailed engraved celestial map published by Johann Baptist Homann around 1735. The map shows the Zodiac signs of the northern ans southern hemisphere, surrounded by various insets of celestial constallations. A good impression in fine original full decorative hand-color. Some marginal toning and a small (1 cm) marginal tear. Half of the top left margin has been replaced. These defects are reflected in the price and overall the map will frame well.